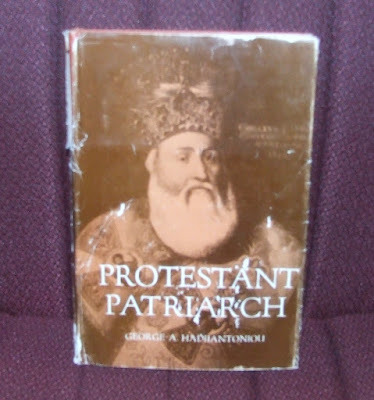 Book Review: "Protestant Patriarch: The Life of Cyril Lucaris (1572-1638), Patriarch of Constantinople"
160 pp. Richmond, John Knox Press, 1961. Cyril Lucaris, Greek Orthodox Patriarch successively of Alexandria (1601-1630) and of Constantinople (1630-1638), is a noble, tragic, sometimes enigmatic figure, a man of exceptional gifts, of towering courage, and of saintly life. Educated in Italy, and in personal contact with the ambassadors in Constantinople of the Protestant powers, he sought to reform the Greek Church along the lines of the Reformation in Europe and published a Calvinist Confessio which has become celebrated. The foreign envoys supported him - and sometimes used him as a pawn in their own diplomatic projects. Inevitably Lucaris, made enemies - notably the Jesuits in Constantinople - and they finally achieved his ruin. He was falsely accused of treason and strangled by order of the Sultan, and his body was thrown into the Bosporus. He is remembered for having made a present to King Charles I of England of the Codex Alexandrinus, as a token of his esteem of the English ambassador, Sir Thomas Rowe. As was to be expected, a controversial literature has grown up about the patriarch. Roman Catholic, Greek Orthodox, and Protestant writers have in turn vilified or praised him, or sought to explain his political and religious motives. The present book is the first extended account in English of Lucaris' life and work, and an English translation of the Confessio is included. The author is a Greek, born in Smyrna, and educated in part in England. He is now minister of the Second Greek Evangelical Church (Presbyterian) in Athens. The book was originally published in Greek in Athens in 1954, a fact which is nowhere mentioned in this English version. Except for encyclopedia articles, the only other treatment of Lucaris' life now available in English is the brief account by Germanos, Metropolitan of Thyateira, the respected Greek Orthodox scholar long resident in England, consisting of a lecture delivered at Cambridge in 1947, Kyrillos Loukaris, 1572-1638, A Struggle for Preponderance between Catholic and Protestant Powers in the Orthodox East (London, S.P. C. K., 1951). Mr. Hadjiantoniou's book, which is frankly "an admiring portrait," creates a vivid picture, but the author has not presented his material to the best advantage, and as Professor Outler observes in his foreword, the book, while it deserves a wide reading, must also be read critically. The scholar who wishes to undertake a critical assessment of the exposition is faced with difficulties. There is no bibliography, no index, and no systematic critical account of the sources. The absence of even a list of the sources, with the necessary bibliographical information, is a disappointment in a treatment of a subject which has controversial aspects. For a scholarly account of the sources and a carefully documented study of Lucaris' life and of the Confessio, the student will still consult the able doctoral dissertation of the German Protestant minister Richard Schlier, Der Patriarch Kyrill von Konstantinopel. Sein Leben und sein Glaubensbekenntnis (Marburg, 1927), which is not mentioned by Mr. Hadjiantoniou. The publisher should have taken care to ensure a more worthy destiny for a book which is intrinsically important. Dumbarton Oaks Washington, D. C.
From Theology Today - Vol 18, No. 3 - October 1961.